Apply it to a clean plastic or vinyl surface. When dry, you can stick it to any surface — a window, the fridge and more! Various smells such as fruity taste, non toxic and safe. 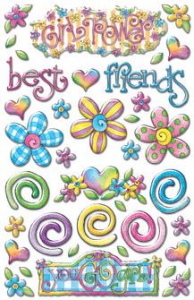 Sparks of color and glitz to favorite paper, plastic and wood crafts. Assorted bright neon colors, non toxic and safe for children.